I wore gold and blue to visit de wine area of Haro and Briones. The pintxos, what we call tapas in the south, are even better than we expected. I could eat them forever. Los pintxos, lo que llamamos tapas más en el sur, son muchísimo mejores de lo que esperábamos. Podría comerlos para siempre. Posted by mispapelicos at 11:55 a. m.
Love this reportage, thank you very much for sharing. The food look so yummy! Thankyou soo much! i shall be posting more fashion pictures of myself soon! I like your blog! Im seeing another side of Spain! Wonderful! Estas guapísima de azul y oro, a juego con los paisajes. Ostia vaya cielo no? Me gusta tu look y las fotos del viñedo geniales. Such beautiful photos! You look so lovely in a lovely place. gorgeous outfit, gold looks amazing on you! love the print of the skirt also. Such beautiful pictures. The 3rd pic down of you is just stunning. You look so beautiful. It's really a great reportage. Love these photos. This place is so beautiful. Mi cielo nos has regalado las imágenes del día... q maravilla d fotos!! Si cierro los ojos m veo contigo entre los viñedos y t aseguro q si m esfuerzo un poco más, puedo sentir ese aroma a uva madura a punto d ser recogida y dar vida a un buen vino d los q allí elaboran! Tu look no m puede gustar más, el dorado combinado con el azul y esa forma d ponerte el cinturón... m encanta!!! D verdad q es d las veces q más GUAPA y ESTILIZADA t he visto... OLE ESE PODERIO D MI NIÑA!!!!!! Un beso grande y lleno de todo mi cariño!! por supuesto, me encanta todo, y qué bien se come!, y has visitado un montón de sitios que conozco bien, qué maravilla!!!!! Y qué bien ver esa sierra al fondo de los viñedos, esa vista fabulosa! That's such a gorgeous place! And these photos capture its beauty so well... Hopefully i'll visit one day! Let me add that you look as amazing as always and that i'm in love with that gorgeous skirt! Woah, that scenery is just unbelievable!! WOOOWWWWWWW!!! Darlin these photos look absolutely fabulous and oh my goodness how great do you look?!! sooo gorgeous and the backdrop is just fantastic! love it! These pictures are so pretty they look unreal. Gracias por visitarme en mi guest post hehe. Beautiful ropa u chose. Xoxo. Such beautiful pictures. The outfit looks amazing and it is so perfect against the backdrop. que sitios más chulos y con encanto!!! Me encanta la foto que tienes de ti con las nueves en el cielo, mola mucho!!!! O,how I wish I was there with you,eating delicious goodies with you,looking fabulous! Pretty pretty pictures!!!! the leaves and fall colors are gorgeous! You look so lovely in that fabulous skirt and super fabulous belt! =) That food looks divine too... I wish I could reach into my computer and try some! One day I'll take you jumble sale-ing in England and then we'll go for lager and pintxos in Spain. Amazing photos, especially the first landscape and the vineyards, absolutely glorious! Yay for wine and tapas, what would life be without them?! 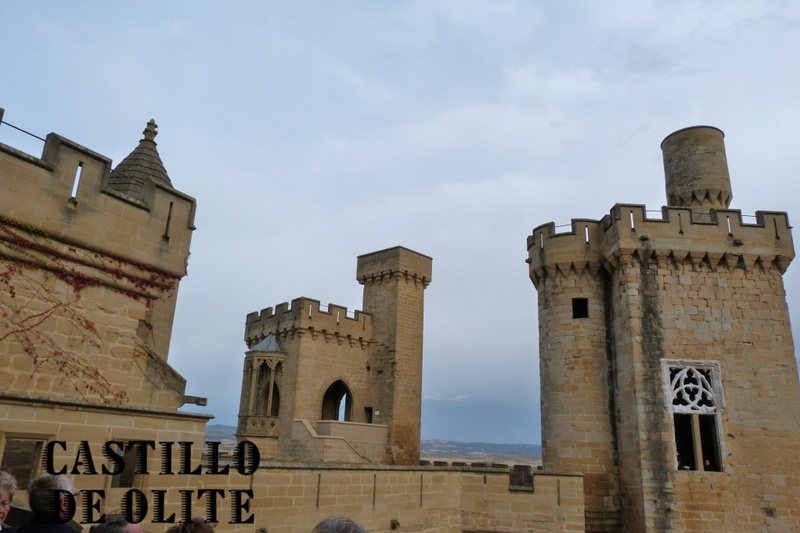 Que bonito castillo!! y las tapas tienen muy buena pinta!!! Beautiful pictures. Your outfit matches so perfectly with the scenery it looks like you were painted in! Me encanta la falda! Pareces parte del paisaje. Pero que belleza se mira resplandiente con su traje divino, me encanta la falda y su collar. Que delicias, se ve todo como un sueno, me quedaria porcsiempre en ese lugar tan bonito. Your photos are always inspiring to me. I especially love you in your blue skirt under the gray/blue sky. wow, what a stunning place to visit! your photos are lovely! So beautiful! The colors are amazing. Gorgeous photos! It looks almost unreal its so beautiful there! great pics..love your skirt and top..winter is coming! wonderful images! i like those old wooden doors...the architecture, all of it. i love tapas. would you believe- they're not served in restaurants here. only big food in texas, it seems! no one i've asked even knows what tapas are. i'll have to make my own! Ahhh, that third picture is so fantastic!!! LOVE the countryside there!!! Wow... such lovely pictures!!!! they look soooo unreal almost like a sweet dream! These photos are amazing :x Your necklace is my favourite piece from these outfit ! I saw your comment on Silverstyle's blog and had to pop over to tell you about http://www.scarves.net/ It gives you 37 ways to style scarves of all shapes and sizes, including how-to videos. Me encanta la foto en la que las nubes hacen juego con tu falda! Buen vino! Qué guapa estás en las fotos! Yo también he estado tanto en la Rioja (mi tía está casada con un riojano) como en Navarra de vacaciones. Me gustan los dos sitios, Navarra conozco más el norte, el bosque de Irati es espectacular. Oh, please you try to humor me. You don't know what to do with a scarf? If that is truly the case pack them up and send them to me! These photos are amazing and so crystal clear. I actually thought that the first one was a painting. You are a work of art yourself. Eat some Pintxos for me please. preciosas fotos!! he pasado un rato de lo mas entretenida con el blog ¡enhorabuena! Lovely travel photos. I love travel photos. I'm looking at all these gorgeous photos and can't quite get over the colours! It's surreal but stunning! wow...these photos, i would love to see this part of Spain one day. the colours are so vivid, and the food (and wine) sound beautiful! thanks for sharing this, I feel like it`s me been there:)love your skirt too! Such a dramatic sky in many of these photographs! It looks like a lovely place to be. And, your asymetrical belt is really a great item. what a beautiful pictures, looks like postcards. 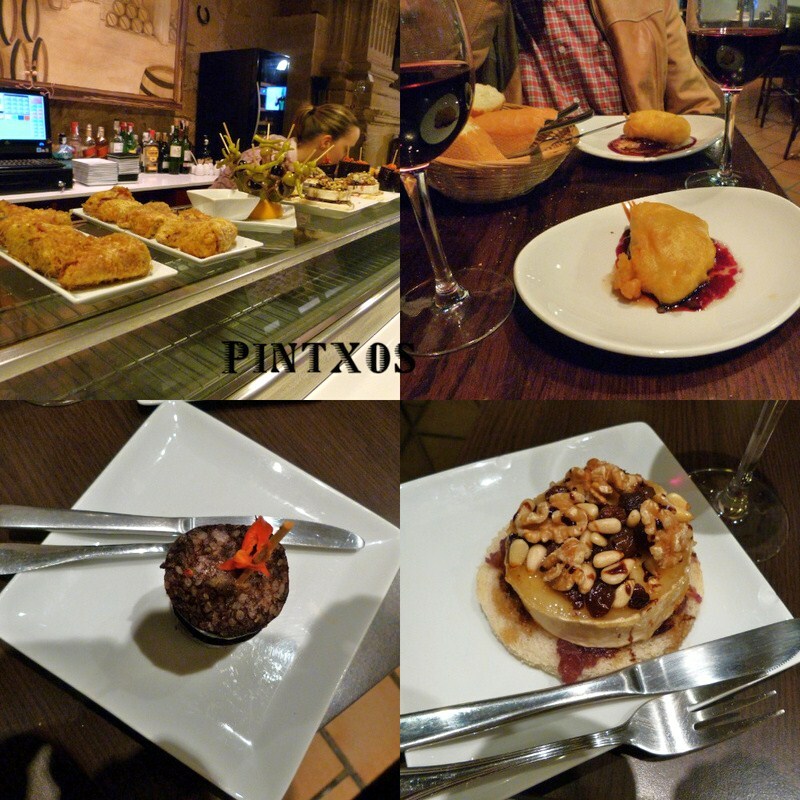 Next time I am in Spain I have to try these pintxos, looks delicious and I never eat this. What I also like to eat in Spain are the chorisso with hot chocolate, I can't find it here in Belgium. it's great to discover the beautiful landscapes of Spain with you ! q monada de falda! y pamplona m xifla! You look so good in that outfit, love the belt, beautiful Spain, awwwwww! love your pictures my friend! Que hermosas fotos y que hermosos sitios, mi favorito es donde los viñedos, los colores son espectaculares! Un beso mi adorada Sacramento. Your third photo is perfect! I love your dress and the background itself! You are very stylish! and this photos are amazing! Me encantan estos post! Ahí he visto mi ayuntamiento y la tienda Gutierrez. Ahí justo entré hace unas semanas para comprar una bata! I love the gold top with flowery skirt and the scenery is just breathtaking, so different from what i see everyday here. Hola bella, cComo Esta? Yo te pienso. Gracias por compartir tus vacaciones con nosotras. Beautiful photos! Breathtaking, really. Also, I gravitated towards your skirt. So vibrant and pretty. 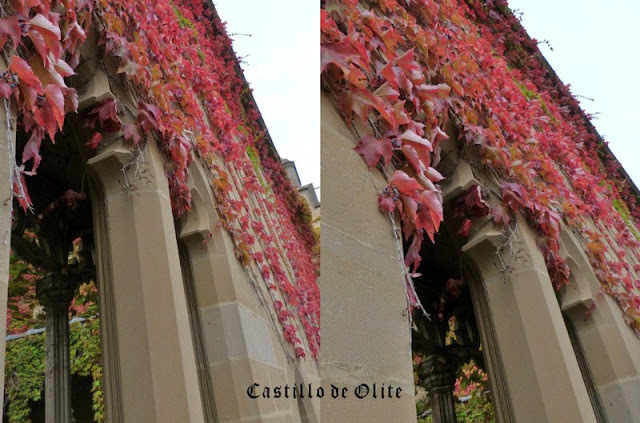 Necesito visitar Pamplona y yo adoro ese castillo. 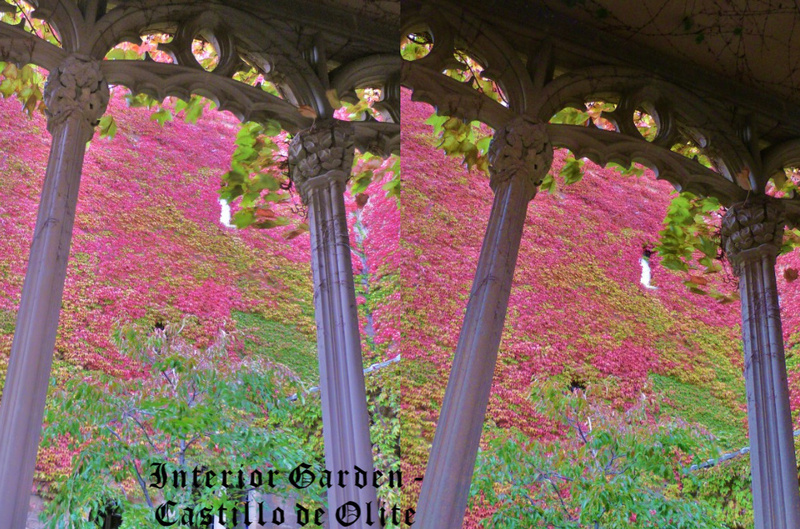 Quiero vivir en un castillo aunque sea difícil de limpiar sin ayuda.